People affected by the earthquake in Papua New Guinea take shelter under a tent. Across the island nation, over 270,000 remain dependent on humanitarian assistance in the aftermath of the disaster and a series of devastating aftershocks. According to the UN World Food Programme (WFP), the aircraft carrying the nutrient-dense, high energy biscuits, departed the UN Humanitarian Response Depot in Dubai, the United Arab Emirates (UAE), Monday morning, and its life-saving cargo will reach those in need within days. The plane used for the airlift was provided by Sheikh Mohammed bin Rashid Al Maktoum, the Vice-President and Prime Minister of UAE and the Ruler of Dubai. “[This] support is crucial to deliver humanitarian assistance to those most affected by this natural disaster,” said Stefano Peveri, the head of the Humanitarian Response Depot in Dubai. More than 270,000 people, including 125,000 children, remain dependent on humanitarian assistance across the Pacific island nation after it was hit by a devastating 7.5 magnitude earthquake in February. The earthquake was followed by a series of severe aftershocks throughout March, causing widespread panic among communities. 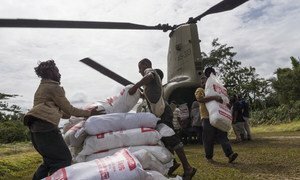 In addition, Papua New Guinea already faced severe food insecurity and alarming malnutrition levels before the earthquake. WFP’s remote assessments estimate that approximately 37 per cent of the population, or 60,000 people, were severely food insecure before the earthquake. The earthquake and its aftershocks have further impacted people in the most vulnerable areas of the country, destroying root crops and vegetable gardens; the primary food sources in the affected area, said the UN agency. One month after a powerful earthquake hit Papua New Guinea, the United Nations warns that “children’s lives are in danger” as access to the affected remote and isolated villages across vast and rugged terrain remains a huge challenge.